They are wearing different suits because in this future, space is heavily privatized and suits- as well as a lot of your other individual resources- are provided by the organization you belong to. It behooves a government-run station like Devotion to be an attractive location for researchers… that way the base gets big name projects on board, and can reap the benefits of having large sponsors and more funding behind them. Bex and Mike belong to quite different outfits so they get… different outfits. His is a lot more streamlined/ modern, which speaks to the type of org he works worked for compared to hers. Kool Kar! So they probably don’t have a speed-limit on Mars, but you don’t want to go joy-riding and suddenly find yourself falling into a big hole hundreds of meters deep. I don’t see how is this kawaii. I can see the logic in his words. Hi. Enjoying the way this comic has started, and am looking forward to see how it progresses. Help yourselves to the ‘mallows, I will get a fire going, if you want any toasted. I don’t expect to comment much but, trust me, that is probably a good thing. You can easily run out of ink if I get going. I may be gone some time. Not seeing much wood here. Maybe I should try in the direction of Mons Olympus? Bet he will soon enough. I’ll tell him to get a job making the candy bars. That’s okay, I’ll just charge you royalties. His name is Internum? Neat! Uh wow, it’s like a lifeline in a minefield. …except that instead of exploding, you posthumously get a new hundred-meters-deep crevasse/tunnel named after you. 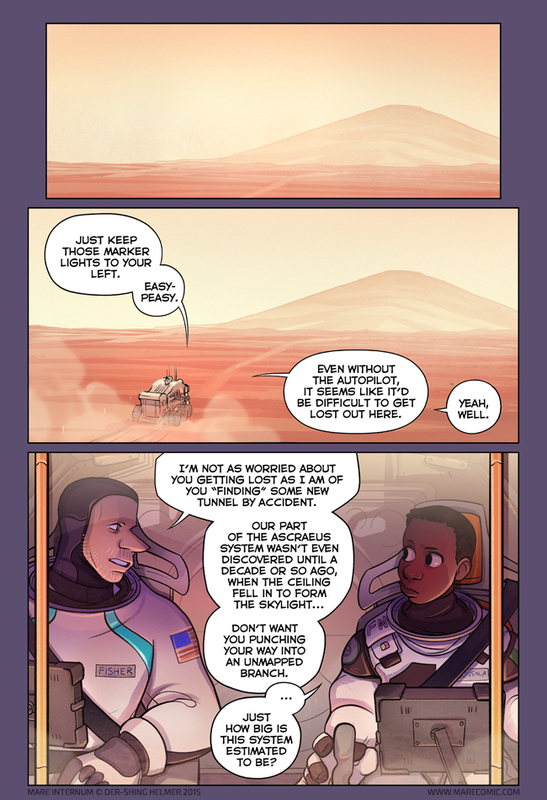 …I expected there was a lot of ways to be put in harm’s way on Mars, but that one, I didn’t see coming lol. Is there any chance to see old votearts, some kind of archive, for those who caught up with this comic only now?